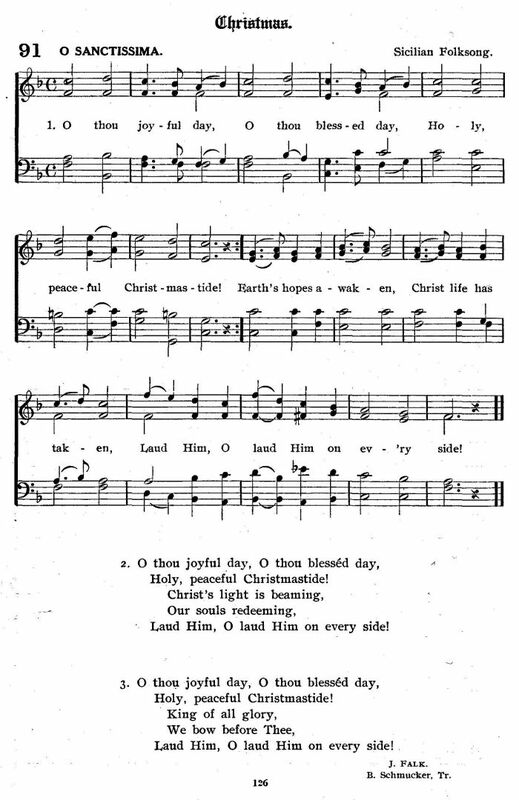 Sheet Music to "O Sanctissima" from O. Hardwig, ed., The Wartburg Hymnal (Chicago: Wartburg Publishing House, 1918), #91, p. 126. "O Sanctissima" is part Christmas carol and part church motet, set to a melody called "The Sicilian Mariner’s Hymn to the Virgin," which may be Italian, English, or even Sicilian. No one knows, sometimes, where tunes originate, or when words become attached to a particular melody. This lovely tune is such a mystery "O Sanctissima," with its original Latin text, was first published in 1794 in the United States. Today, the opening bars are familiarly known for their use in the song "We Shall Overcome."